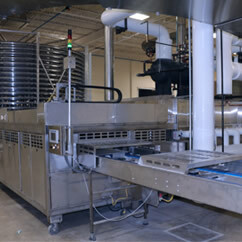 CBF Bakery Systems designs and manufactures a wide range of pan and product handling systems for the food industry. No matter what products you make, we can develop a solution that meets your requirements — whether that means delivering an individual piece of equipment or designing and integrating a complete production line. In order to ensure quality, we handle project engineering, mechanical and electrical design, equipment assembly, testing, installation, and after-sales service at our state-of-the-art manufacturing facility in York, Pennsylvania. Increase your system’s productivity, reduce waste and lessen the need for manual labor with our automatic oven loading and unloading systems. We’ve designed our oven loaders and unloaders to handle products of just about any size and shape, including hearth products, pans, and bake-able cardboard, aluminum tins and plastic trays. Our step-style proofing, retarding and cooling systems are compact, have few moving parts and are simple to operate and maintain. 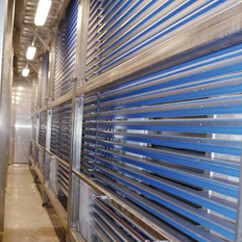 The units are custom-designed for maximum efficiency and built to last. Our step-style accumulators are compact, have few moving parts, and are easy to operate and maintain. 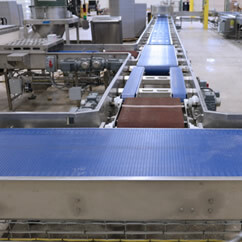 Designed to automatically store pans and/or boards for a set period of time when a line stoppage occurs, they reduce the need for manual labor and make the production process more efficient. 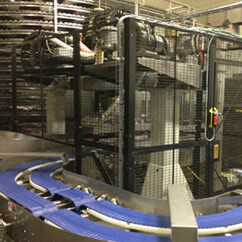 Our conveying systems handle products gently, minimize transfers and guard against product jamming. All are constructed from stainless steel and are easy to clean and maintain. Our state-of-the-art PLC control systems give you precise control of production rates, which you can vary by product and pan type. Count on reliable conveying of all your products, every day. Designed for a wide variety of products, our automatic depanning systems increase your efficiency and eliminate the need for manual labor. Available with vacuum and/or needle attachments for consistent and reliable operation to boost productivity and reduce operating costs. 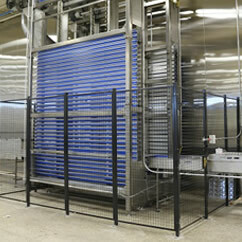 We’re equipped to meet the increasing demand for turnkey solutions while maintaining our commitment to our customers. By working closely with your team as well as other high-quality equipment suppliers, we can supply and integrate a line that fits your needs. In our industry, design and technology are always in flux. So we provide you and your staff with the support and training you need to operate and maintain the line and maximize your return on investment. Training is available at installation and startup of the line, in a classroom environment or at our facility. After-sales service is important for our customers, and our experienced service technicians are ready to assist you when required. We can perform line inspections and deliver recommendations and solutions for any problem that arises after installation. In addition, our parts department is dedicated to your needs and will do whatever it takes to accommodate your parts requests in a timely matter.